Breathless, that’s the word for our visit. The Boboli was a race from start to finish. One eye on the clock to be sure we did not miss our bus. Starting position was the long queue for tickets. Minutes lost. Energy high. We’ll make up the time. So sorry. Mistake. Wrong tickets. These are for the palace. Go back on line. 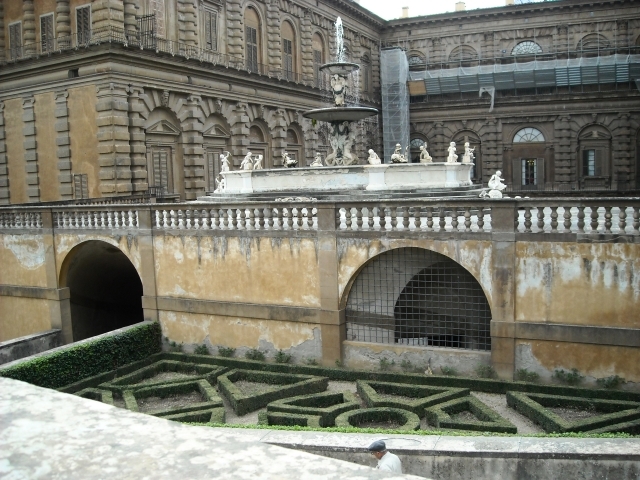 Pitti Palace, across the river from the Duomo in Florence, was once headquarters of the Medicis. The palace adjoins the garden and is now home to quite a delectable collection of art. Hence the “mistake,” though we never did figure out how “garden” could be confused with “palace” in either English or Italian. We should have been sharper. Too complicated to ask for an exchange. With tickets in hand for both, we felt obligated to share garden time with palace time. Garden first, of course. Curious, the first thing we saw when we finally entered was an arrow pointing to the Exit. Not so welcoming, perhaps, but we were on a mission, so we found our way. Now, to enjoy this garden, you should think of it as a park, a place to wander at will. Study the statuary, loaf on the lawns. Stroll through the allees, unpack a picnic lunch. Visit when the sun is warm and roses are blooming. Take a nap and lose the day. One should definitely not spend one’s time watching the clock and running around looking for a grotto and a statue of Bacchus. These were the must-sees, we were told (with the greatest of authority.) We did not know what these must-sees looked like. We weren’t even sure we knew what a grotto was. Nor did we know where these must-sees were located. So we went hunting, crisscrossing the two main axes of the garden, clambering up and down hills. Sometimes we allowed a stop to catch our breath. Almost as an afterthought, we began to understand the elegant layout of this 11-acre Italian garden, originally designed in the 16th century, by default a prototype for Italian gardens. Its terraces and paths, sculpture, ponds and fountains, would eventually become etched in our memories. So maybe there is virtue in jogging around a garden. We should point out that everything is up from the Arno River. 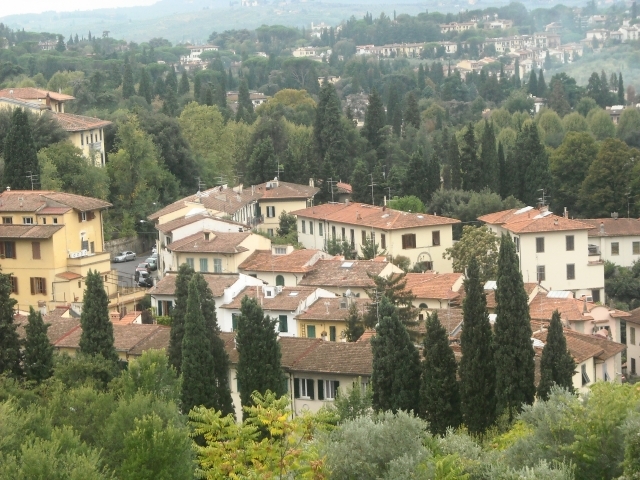 That means the Boboli is truly a garden on a hill. Lots of steps and paths, all of them up and giddy-on-the-eyes. First spectacle, tucked into a rise, is the grand amphitheatre with its Egyptian obelisk and hedges lined with statues of Roman mythology. Up a hill and you meet the Fountain of Neptune, teasingly called the Fountain of the Fork by locals. Abundance, one of the loveliest statues in the garden, is modeled in marble after a queen of Austria. The Isolotto, an islet created in an artificial pond lavish with statuary, is like a jolt of caffeine to your senses. The Fountain of the Ocean, another tribute to Neptune, surrounded by deities synmblic of three rivers, Perseus on horseback (we missed him but he is back in place now), Andromeda chained to a rock, pots of orange trees on terraces, male harpies, fantastic sea creatures, mountain goats, engaging children. What do we look for next? For Bacchus and a grotto, of course. But not here in the Isolotto, and not among all the statues we met around every bend in every path. The garden, we soon learned, is a museum to statuary: exquisite, beguiling, dramatic, grotesque, fearsome, and, yes, even horrid. A collection from centuries that defies organization. 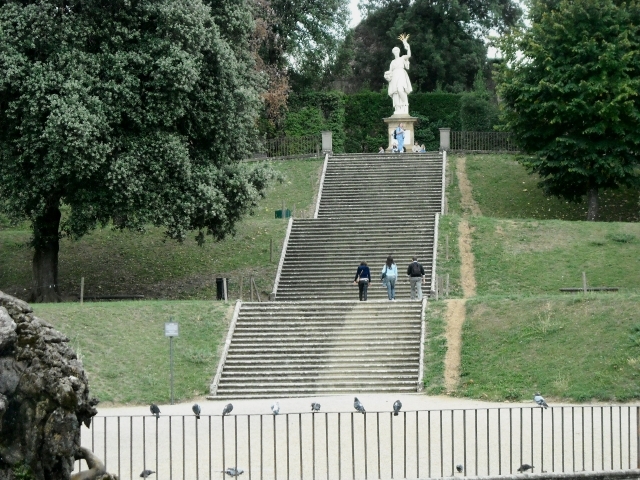 We closed in on all but the final stairs to the garden’s highest point, the Garden of the Ramparts near the Porcelain Museum. Do we really need to see this one? You go, then tell me about it. 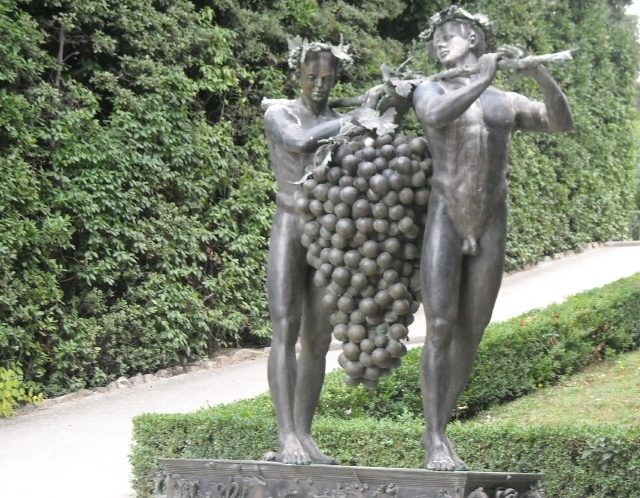 (After all, who would hide Bacchus at the far end of a hilly garden?) You’ve got to come see this. You mean? Just come. For what? Parterres planted with spent roses and perennials? Over here, by the wall. Oh my, that’s all we could say. The green hills and weathered terracotta roofs of Tuscany spread out before us, muted palette of a long-ago past. We paused in our race, arrested by the great age of this landscape. We drank peacefulness under gray clouds misted in blue. Reluctantly we headed down to the Exit arrow. We’d missed our targets but we’d had a memorable time. 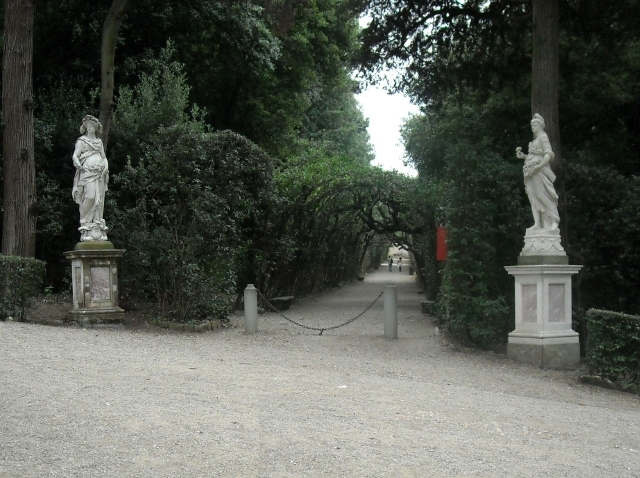 After all, we had never jogged through an Italian garden before. We turned a corner to leave, and there was Bacchus. Not Bacchus exactly, but a rendering of the palace dwarf, Morganta, in a grand moment of bacchanalia. Rotund and proudly naked, riding high on a turtle. Choice comments on Morganta can be found in Dan Brown’s novel, Inferno. From the laughable to the ethereal. We turned our heads and there was a large and unmistakable grotto. La Grotta Grande, or the Buontalenti Grotto. Stalactites descending from the facade and covering the ceiling, faded frescoes, marble statues, scenes of mystery and terror, an oddly romantic retreat for clandestine lovers’ meetings convenient to the palace. We finally figured tr out. We should have known. The must-sees for the fast-paced tourist would have to be along the shortest route in the garden. Just think, if we had done our homework and mapped out a plan, we might never have gotten to know this garden.